National Police Memorial, Delhi - Winning entry by Studio Lotus - ArchitectureLive! The Shanti Path vista, a visually striking part of Delhi has an axis that orients itself South-Southwest for a straight distance of over 2.5 km from the Police Memorial site to the Rail Museum flyover. It is a beautiful vista in a city where such resources are rare, and deserves to be highlighted. The high visibility of the site itself is a great opportunity to create a statement that is striking and will encourage people to explore a new addition to Delhi’s landscape. This axis links to Rashtrapati Bhawan symbolically in the other direction (not physically visible from the site). Rashtrapati Bhavan is the residence of the head of the Indian State; the protection of which is the raison d’être of the police. It is important to remember that the whole site must reinforce the concept of the memorial, and not merely be an object set on a plinth. The central location of the site and its proximity to several beautiful and iconic buildings allows for a response that is complementary and becomes a valuable and fitting termination to this axis. Considering the variety of expected visitors to the site, we generated a response that is holistic in nature yet allows for myriad layers of experiences. This could only be achieved by generating a program that was “layered” in nature allowing a multilayered and individual experience for each visitor. We began by identifying the prominent axis cutting through our site and studying the relationship of the site with Shantipath and Rashtrapati Bhavan. As a response to the given site conditions, i.e., the presence of a 1.77m high plinth with a basement below at the heart of the site, we chose to submerge the plinth under a mound and carved the space from within it. 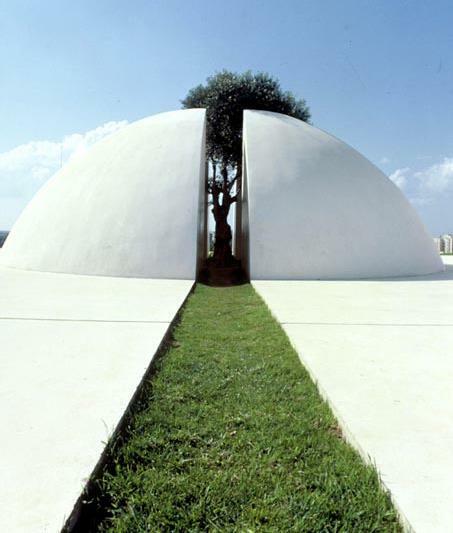 The memorial itself takes the shape of a wall surrounded by a sloping earth mound. This form was arrived at with the idea of ‘sheltering hands’ cocooning the centre. The recreational zone, defined as the peripheral pathway (re- aligned to a more symmetrical and geometrical form ) will be used by morning walkers and casual visitors. Picnicking, music and playing will not be allowed in the memorial park. 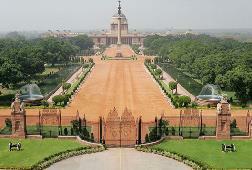 The entry to the museum through the Satyamev Jayate wall is on the Rashtrapati Bhawan axis from the USD Marg. This leads directly to the plinth basement, which is also connected to the outer periphery by 2 subsidiary ramps. Between the recreation area and the memorial are layers of ‘protection’ symbolizing the various police bodies and the functions they perform from on our borders to our neighborhoods. The concentric ring of trees symbolizes the layers of protection given by the police. The rainwater fed lotus pond ‘moat’ emphasizes this protection. 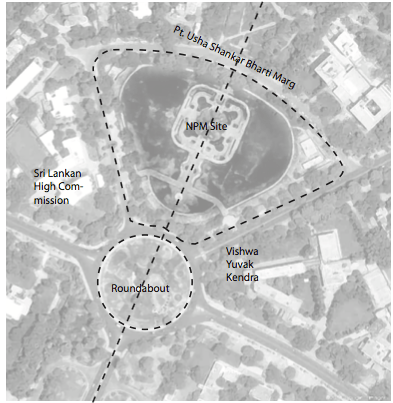 The path around the lotus pond ring draws reference to a Parikrama, as a symbolic sacred gesture. Given the nature of the site and the programme it was felt appropriate that various areas of the site be de signed for various functions. Our approach to the memorial space was not to de ne it by the presence of a central object, but rather to create an experience of an absence. The central space ringed by a ‘Wall of Remembrance’ is 25m (82’) across and the ramp forming it encloses it in heights from 3m to 7m. This is in the form of a Red Sandstone or GRC jaali. The presence of the jaali is significant, as it allows those inside, to view the outside, while guarding them from view, thus heightening a sense of security and privacy within the innermost volume of the memorial. The inside of the mound is a wall of stacked marble, with a weeping wall of water. The wall is lit at night and forms a backdrop for the 9m high cylindrical jaali. 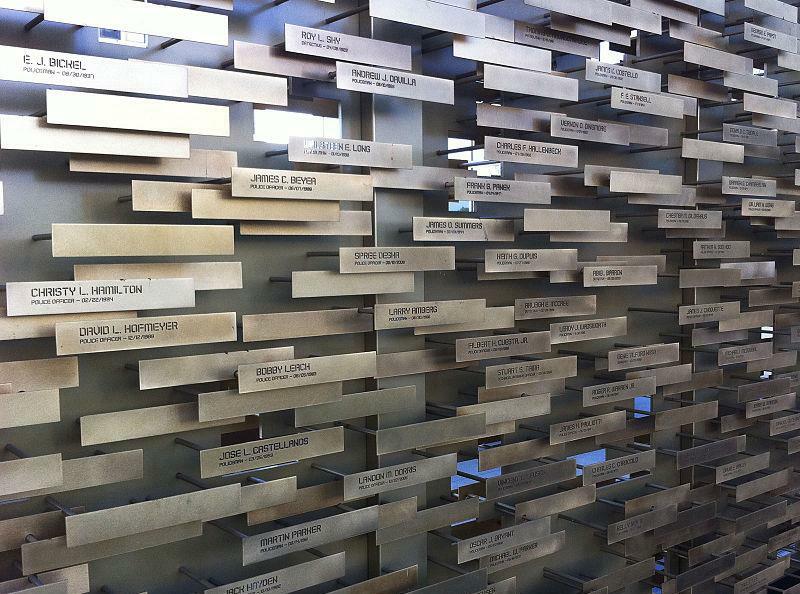 There are stone/steel plate name tags with names of the deceased police personnel inserted into the jaali. This jaali and the floating stone platform in front will also facilitate the placing of flowers, candles at the base of or next to the names of the martyrs as an offering. 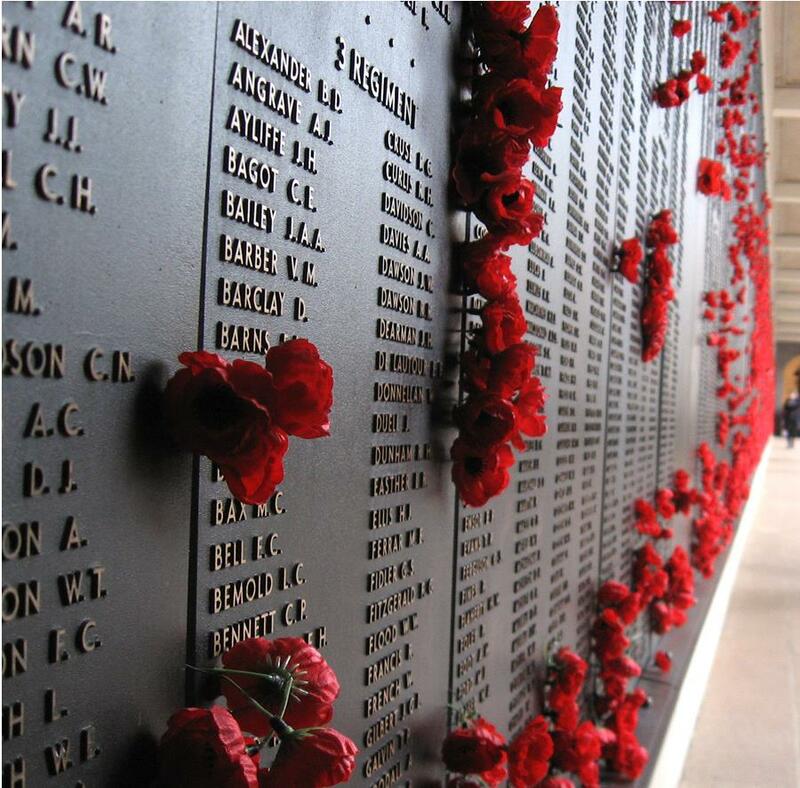 The ‘wall of remembrance’ acts as a dynamic device, complete in itself yet with scope to grow and evolve with time. The shadow patterns of the jaali, the white marble and red sandstone link to the Rajput, Mughal and British architectural expression which is Delhi’s architectural heritage. 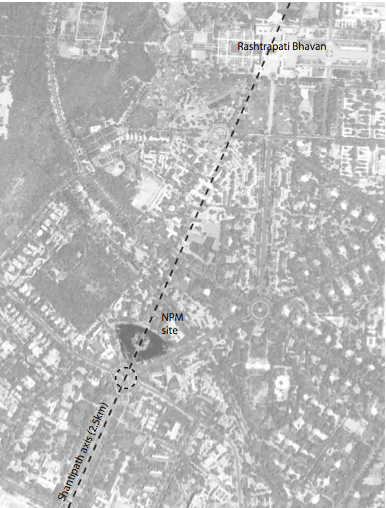 To generate an added spatial perspective, the central cylindrical form is circled by two 8‘ wide ramps, starting from the top of the plinth (whose present shape is imperceptible under the mound). These ramps each curve to form a bridge exactly on the axis. As one ascends this ramp, one starts to experience the memorial from a shifted point of view. The landscape slowly begins to reveal itself and simultaneously the jaali containing the inner core of the memorial, allows for subtle interactions with that space as well. While all other elements on site, explore the horizontal axis, this allows one to explore the vertical. At about 7m height the ramps will provide a beautiful view down the Shanti Path axis. This vantage point will also reveal clearly the Ashok Chakra pattern in the memorial space and the eight- spoke ‘Wheel of Law’ axes radiating out from the memorial. 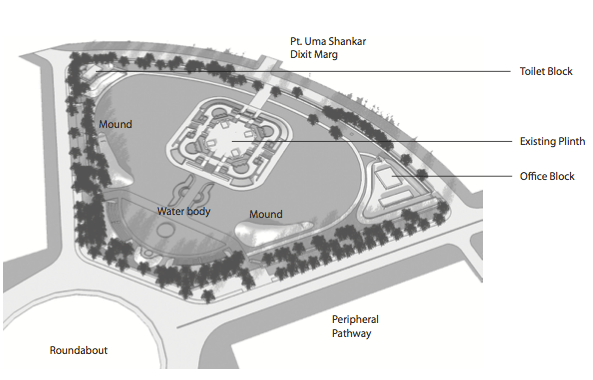 The protective layer of trees outside the memorial will be chosen from the native and natural trees of Delhi. The idea is to express alternate landscape aesthetics to evergreen plants, lawns and hedges that reflect seasonal changes. Grass areas are limited strictly to the periphery outside the path, the slopes of the mound and the ceremonial area.The tree cover on the edges of the site will also be strengthened to reinforce a sense of protection. The axial lines towards the roundabout and the main gate will however be left completely at and open for the view to be clearly visible.We are also keen to incorporate a self sustained irrigation system for all the landscaping, fully supplied by rainwater harvesting. Farhad Contractor works for the NGO Sambhaav, which works in arid parts of the country to rejuvenate traditional systems of rainwater harvesting. He is also a member of the Planning Commissions Work Group on Water. Farhad visited the site with us and was convinced of the feasibility of using rainwater to feed perennial water bodies on site, and also to raise the water-table of the site and the areas surrounding it. The Museum of the Police Memorial is accessed from the Uma Shankar Dixit Marg entry. A stone wall with the Lion Capitol and Satyamev Jayate cut-out of the stone is one’s first impression. The path immediately leads to a staircase going into the museum in the basement under the wall. The museum will display uniforms, medals and arms of the various Indian police bodies through the ages. It will also serve as a display space for a looped audio-visual showing martyred police personnel in uniform and out, with their families and friends with an unsentimental but gentle voice-over giving a brief description of their life and the manner in which they laid down their lives. This will serve as a poignant reminder that the names and numbers we read in newspapers were actual people whose lives were interlinked with others, who still grieve their loss. Moving out from the museum either back up the stairs or from one of two ramps, brings one to the circular path between Internal Memorial space the tree groves and the lotus pond moat. This path forms a Parikrama around the earth berms, accentuating the feeling that one is approaching a place of homage. The single entry to the memorial space further emphasizes this feeling. The slit-like opening in the berm and jaali wall leads one to an 82’ wide circular space. The slit opposite the entry provides a view of the Lion Capitol wall over the museum entry. Six other 1.5’ wide slits are oriented with the radial paths leading from the Parikrama to the peripheral site path. These six slits, along with the entry and exit, total eight, and symbolize the eight spokes of the ‘Wheel of Law’. As one moves up either of the framing ramps beyond the ‘wall of remembrance’, the view of the memorial space through the jaali changes until one is at the highest point of the structure. At this point, the entire green and grey Shanti Path vista becomes visible, and the axis changes from a notional entity to a tangible one. The 24 spokes of the Ashok Chakra in the memorial oor reveal themselves clearly for what they are, and the concentric tree circles emphasize that the nation is protected by the various police organizations. The jaali of the ‘wall of remembrance’ will cast shadows that change with the hour of the day and the seasons of the year. The internal memorial space is seen as a place of quiet contemplation, homage and remembrance. 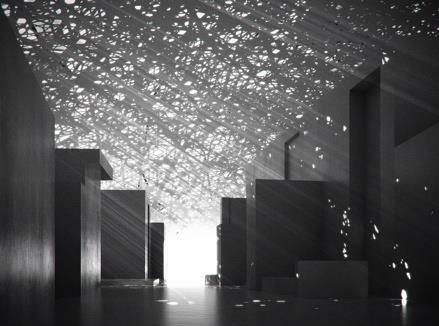 The aim is to use scales of space, materials and symbols to create a place that encourages silence and introspection. The act of searching for the name of a loved one is an act of love and remembrance, as is that of placing a ower in the niche next to the name. The outer tree grove is a simply arranged set of trees in rows that descend in height towards the central memorial. The gravel-strewn spaces between trees are furnished with benches to encourage quiet and introspective use of the space. The design approach is based on a layering of experiences and has evolved as a response to the multiple contextual frames of references that the brief and the site o er. The design strives to reveal itself as the visitor moves from the outside to inside, resonating with different emotive states, from the exploratory and knowledge-seeking to the contemplative. 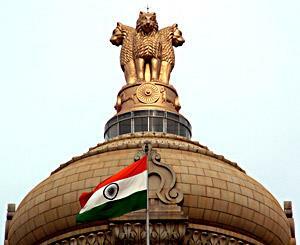 Universal symbols of National identity such as the Lion Capitol with the Satyamev Jayate inscription, Ashok Chakra and the Indian flag become anchors for the space. View from one of the entrances to the memorial. 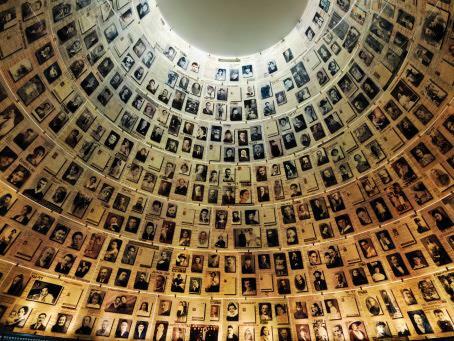 The ‘Wall of Remembrance’ itself lies at the core of the site, an inward-looking, cocooned yet dynamic space that is responsive to the light around and allows names to be added without seeming incomplete at any point in time. The additional layers of a ramp wrapping around the core, a grove of trees and a ceremonial space apart from the museum at the lower ground level add depth to the experience of the memorial and allow the site to be used for activities beyond just the iconic.